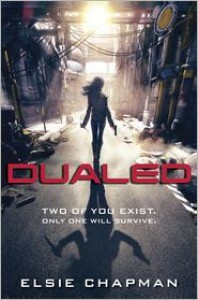 Dualed was one of my most anticipated books of this year, as soon as I saw the synopsis I was in. The book itself is entertaining, to say the least. I was easily kept on my toes during this story, it's just a shame to say that if you stop and think about it for a minute, there is quite a bit of empty space as far as the world building is concerned. The characters as well, left a little too much to be desired.Dualed introduces us to a a world where they make it so for every person born, another will share the same DNA as a way to get only the best and brightest for their city. Which means one of them has to prove to be the stronger, better Alt. One of them has to survive! Fans of sic fi as much as fans of dystopian novels would get the urge to read a book with such a fascinating premise. Some of it is done quite well, too, like how their system for active Alts is put in place to make the "hunt" exactly that--a hunt. It's exhilarating and you always feel the need to look over your shoulder. The book is not without excitement and it's fair share of gore. You have to take it as it comes, however. If you start thinking to much about the ways of their world, how all of this would actually work in a society, you'll come by a few walls and greyed out areas. For instance, if this world would come to play, I'd presume there would be a constant problem of people--be the parents, or the kids themselves--killing the Alts before they even become active. It's not hard to make a death look like an accident when kids with guns are flying high in the streets shooting at their alter egos. Where bullet proof glass is needed in establishments because stray bullets are a thing of every day life. Details such as this left this world into a bit of an implausible slur. I'm aware this is a fictional sci-fi novel, but what makes dystopians especially poignant, like The Hunger Games for one, is the realistic setting they've been given. Details are fleshed out, every aspect of their world is explored making it easy to get submerged into the novel, but even more important, making it easy to sympathize, to feel the emotional consequences of it all.West, our protagonist, is a difficult character to talk about because she lands in the middle of about everything. She's not weak nor tough, she's not super intelligent nor dumb, she just is. There are some parts where she shows a lot of strength and definite courage, but I was disappointed by her running and hiding once she became active. She could put a bullet into a stranger's head, yet she turns coward to her own completion. I'm fairly certain we were meant to understand the difference between killing a stranger versus your own face, but that wasn't communicated to me as a reader. May it be the lack of character or world building, or a simple miss in terms of emotional involvement, it was not made possible for me to put myself in her shoes and understand her hesitations.Chord, the main supporting character, is the "boy next door" that we all love. It was great to have a character who knew when to leave well enough alone. He knew when he was welcome, and when he was not helping. Though he still found a way to make sure that West was ok. Those looking for a big romantic subplot won't find it here, however. These two do have a strong bond from being friends for so long, and there is definite attraction there, but the romance is not a part of the book at all. We see a glimpse of it towards the end and that's that. This is a positive aspect for me, though, since I've become a little tired of the cookie cutter romances dystopians often have. At least, even with the world building issues I had with this novel, there was enough going on to keep most of my questions at bay. The constant moving, running, killings, easily invested me in the plot, making it an easy and quick read through to the end. An end, might I add, that I was really satisfied with. There were great plot shifts that kept it exciting, giving it the perfect pacing, not anticlimactic nor too drawn out. I've also been noticing that often when it comes to a series, the world building gets halted until the sequel which is where we really start to collect details that brings this world into existence. I guess it will all depend in what you're expecting, if you want an exciting, non stop ride and you're a fan of dytopians, then yes, this is one for you, my friend!